Whether on the lakes or the seas, David Rowe is truly a sailor for over 40 years. 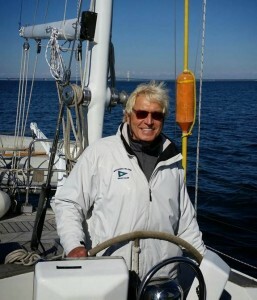 He is the Chairman of the Michigan Crossroads Council Sail Training Committee. He has led sail training programs for youth sailing in the Boy Scouts since 1979. A college sailing instructor in the British Virgin Islands, Rowe teaches sailing and live aboard fundamentals all over the country and world. David is a Coast Guard licensed Captain. He holds; a Great Lakes Masters 100 Ton License, an ocean going Operation of Uninspected Passenger Vessel Waters qualification, an Auxiliary Sail Endorsement, and Assistance Towing Endorsement. On the water he moves fast. Rowe has participated in many long distance races including: Six time participant in the Annapolis to Bermuda Ocean Race, Six Port Huron to Mackinac Races, Eight Chicago to Mackinac Races.